A civil lawsuit was filed yesterday against UBS Group AG UBS by the U.S. goverment. The Department of Justice accused the Swiss bank of deceiving investors who purchased billions of dollars of subprime and other risky mortgage loans just before the 2008 financial crisis. Attorney Richard Donoghue said in a statement that the bank along with its units securitized more than $41 billion of mortgage loans. These were in connection with deals, which turned out to be "catastrophic failures". According to a person familiar with the matter, the lawsuit was filed only after the company refused to pay $2 billion to the government to settle the matter. Apart from UBS, many other companies have been accused of alleged misconduct in connection with the sale of mortgage-backed securities in the run up to the financial crisis. Some other banks like Bank of America BAC, Barclays Plc BCS, Citigroup C, Credit Suisse Group AG have faced similar charges by the Department of Justice. UBS did not comment on the lawsuit or the negotiations. In fact, this lawsuit is one of the two cases that are currently outstanding against the bank. Recently, prosecutors in France argued in a Paris court that UBS should be fined 3.7 billion euros for money laundering. The bank is said to have helped the rich French people evade taxes. It faces accusations of laundering the proceeds of tax fraud and illegally soliciting clients in France, after an investigation of almost seven years. Per the French law, people who have been found guilty of money laundering can be asked to pay a fine equivalent to almost half the money that is laundered. According to the prosecutors, the customers of UBS concealed some several billion euros from the tax authorities. Notably, the prosecutors have appealed for 6-24 months of suspended jail sentences for six UBS executives and some former executives. Along with this, the executives may also be asked to pay fine between 50,000 euros and 500,000 euros. However, denying any wrongdoing, UBS said that the trial's conclusions were faulty and hence has challenged the fines imposed on it. 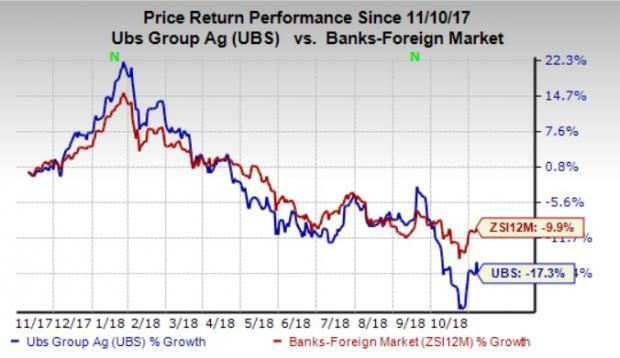 Notably, UBS has been exposed to a number of claims, disputes, legal proceedings, government investigations and regulatory matters in the recent times. Because of these, legal costs are likely to remain elevated in the near term, thereby hurting profitability to some extent. Shares of UBS have lost 17.3% over the past year compared with 9.9% decline of the industry.